One of our TW members, Edward Hill, is making a great offer to other Transition Towns. Edward is the artistic brain/hands/talent behind our beautiful 'photosphere' Transition Westcombe logo - those who live in Greenwich, especially, may have seen a number of them in galleries, shops and elsewhere. Click here for Edward's website. 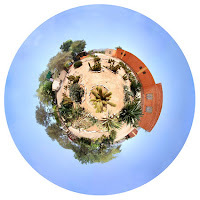 These beautiful 360 degree photographs appear to take a landscape or streetscape and turn them into circular panoramas - see the selection on this page. 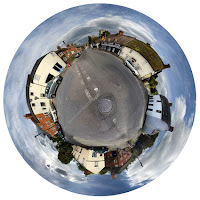 Edward's offer is to make a photosphere for any transition town which requests one, depicting their own area - either for use as a TT logo or, if you already have a logo or have plans for one, simply as a beautiful depiction of your neighbourhood. Edward has already had interest from other TTs and his offer is that, if he is travelling through your area and you have expressed an interest, he will stop off and work his magic for you. It's turning out to be a great way of making contact with other transition people. 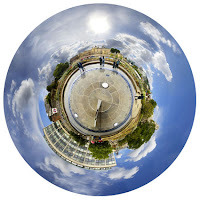 What a wonderful art project it could be to have dozens of TTs represented in photospheres and collected together, every community depicted as a miniature planet emphasising the unique nature of each. I am happy to donate photospheres for logos at no charge to other Transition Towns, and hope that at some point you are in a position to make some equally tempting offer to the Transition Towns in Greenwich! If your transition town is interested, do get in touch with Edward at edhillATglartists.com (replace 'AT' with '@').